The 2019 Spring BIG BOOK SALE is April 12 to 14 in the Library’s Lane Room. The foundation raises more than half of its operating revenue directly from the sale of donated books and media. These funds, along with the proceeds from other events and direct donations, allow the library to continue its full extent of community programs and contribute substantially to the collection budget, as well as community access to technology. Would you like to volunteer at the book sale? Do you have books you'd like to donate? The Burlingame Library Foundation, Trustees and staff collaborate on the Guess Who's Coming to the Library! Speaker Series, featuring innovators, experts and original voices in the arts, current affairs, science and technology. 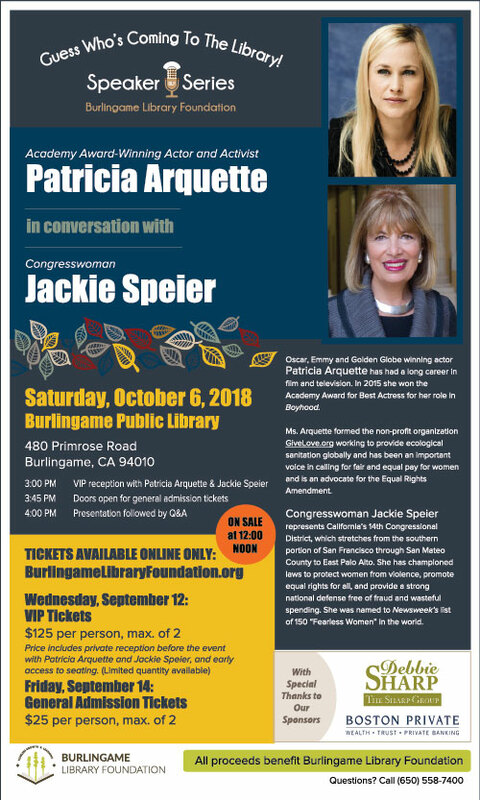 The main library in downtown Burlingame hosts these events in its historic, beautifully renovated Reading Room. Thank you to our generous community sponsors! Three authors with intriguing books, delicious entrees and vendors offering gorgeous jewelry, clothing and other items attracted more than 185 library supporters to the 12th annual Book & Author Luncheon on September 8, at the Peninsula Golf & Country Club in San Mateo. Seated at tables accented with lovely floral arrangements under sparkling chandeliers, they responded generously to City Librarian Brad McCulley’s call to fund a homework center coordinator at the library for the coming year and heard featured authors describe their different paths to publication. Peter Rubin, a senior editor at Wired and author of Future Presence: How Virtual Reality Is Changing Human Connection, Intimacy, and the Limits of Ordinary Life, explained how this new technology is reshaping human interactions. Meg Waite Clayton, whose latest book, Beautiful Exiles, is based on Hemingway spouse Martha Gellhorn, spoke of abandoning a career as an attorney to become a self-taught, successful novelist. And Matt Richtel, a Pulitzer Prize-winning New York Times reporter whose latest thriller is titled Dead on Arrival, recalled his long journey from writing what other people wanted to listening to his own voice. The luncheon and its companion online auction were a big fundraising success. The auction alone brought in more than $18,000. Thank you for so generously demonstrating your love for our two libraries!